It’s Sox versus Sox this weekend, as the Chicago White Sox come to Fenway for a three-game series against the Boston Red Sox. The two Sox are separated by only one game in the loss column, with the Boston team 4.5 games behind the first-place Rays (and playing them six times in September) in the AL East and the Chicago version just 1.5 games ahead of the Twins (who they play three more times) in the AL Central. The wild card? Still up for grabs. Short version: this is a big series, folks. So how can the Chicago nine beat my Boston squad? 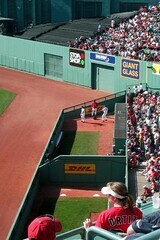 The answer is simple: get to the bullpen. Yesterday, after Jon Lester spun yet another quality start, blanking the Yankees for six-and-two-thirds innings, Okajima came in with a runner on second. Okajima has not been good with inherited runners this year. He promptly surrendered a game-tying, pinch-hit home run to Jason Giambi, and the Red Sox lost in the bottom of the ninth. This scenario is, by now, all too familiar to Red Sox fans. And this series against Chicago should present plenty of opportunities for the same. Tonight, Daisuke Matsuzaka takes the hill for Boston. While Dice-K has been very good this year (2.98 ERA, 15-2 record), he averages about 5 and two-thirds innings per start and has a 1.50 K/BB. The Sox will be lucky if he gets through the sixth. Tomorrow, the likely starter is minor leaguer David Pauley, in place of the injured Josh Beckett. Pauley isn’t likely to make it past five frames. Sunday, the Sox have Tim Wakefield going, which could go either way. Wake can still cruise through lineups when his knuckler is fluttering, but at 42, he’s a little old to be left out there to labor. So in at least two of the three contests, all the White Sox will have to do is play the waiting game. Chicago isn’t particularly renowned for their patience (they’re sort of middle-of-the-pack when it comes to walks), but they’ll be facing Sir Walksalot in the person of Matsuzaka, a Triple-A pitcher in Pauley, and a knuckleballer in Wakefield. If they can lay off any pitch that’s even remotely borderline, they’ll get their fair share of free passes, and they’ll drive up the starters’ pitch counts. And when the relievers come in, the White Sox won’t have to wait any longer–they can swing for the fences. See Alejandro’s assessment of Chicago’s key weakness here.